Frederick Holder was a teacher like his father, teaching first at Prince Alfred College, then at Freeling and finally at Kooringa (Burra). In 1878 when he was not selected as the teacher at the new Burra Model School, Holder purchased a store at Burra, selling books, wallpapers and homeopathic medicines. He also became Town Clerk. In June 1878, he purchased the Burra newspaper from Henry Pether. 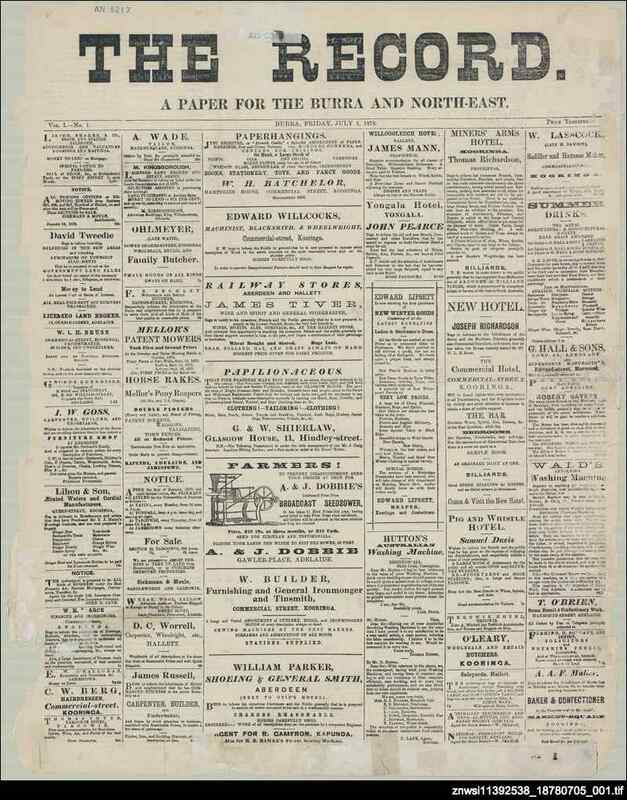 Initially named the Record, from October 1878 the newspaper was renamed the Burra record. Holder was elected to South Australian Parliament in 1887 but was still running the newspaper in 1891, a year before he became premier. In that year the newspaper was taken over by WJ Davey. The Burra record ran until March 1977 when, along with the Orroroo enterprise, it was taken over by the Port Pirie recorder to become the Review-times-record. At the time of its demise, the Burra record was run by Messrs RE and AJ Angel.